Summer is at its peak in most parts of our country. Summer in India is synonymous with watermelons, mangoes, jackfruit, and tender coconut. The roadsides are laden with mounds of watermelon. Usually you can see a lot of tender coconut vendors as well. But this year, due to the heavy cyclonic rains, in and around Chennai, many coconut trees were uprooted, due to which the supply of tender coconut is very less and hence this natural coolant has become a luxury drink in Chennai. Squeeze the grated ginger and extract the juice. 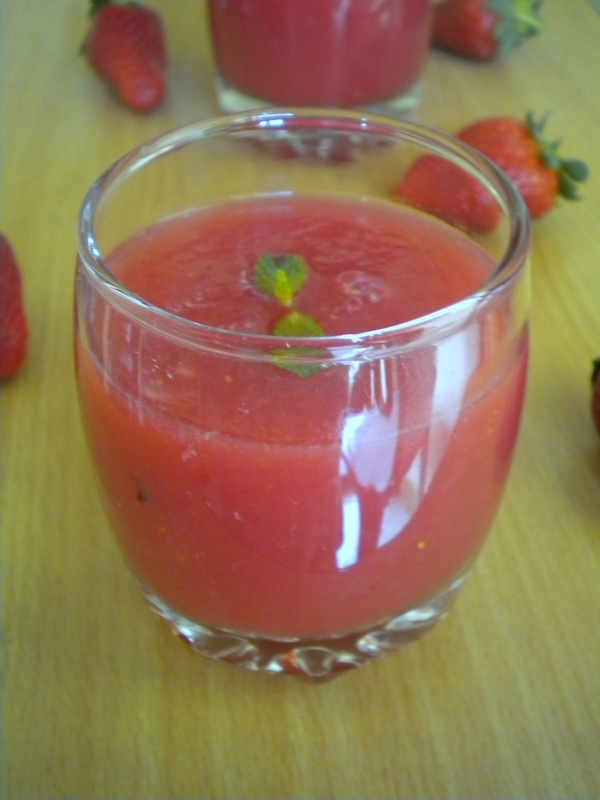 Blend the watermelon and strawberry until smooth, without adding water. Add the lemon juice and the ginger juice and stir well. Lovely color kaveri. You are so right tender coconuts have become so pricey that we are left with just watermelons to tackle the heat. Refreshing drink..the color is so tempting.. I cant take off my eyes from pics. wow. Wow, nice cooler dear, I've never mixed watermelon and strawberries..
Nice cooler to beat the heat.. Wonderful combo cooler Kaveri...looks so inviting! Nice combo. Love the addition of ginger in it. 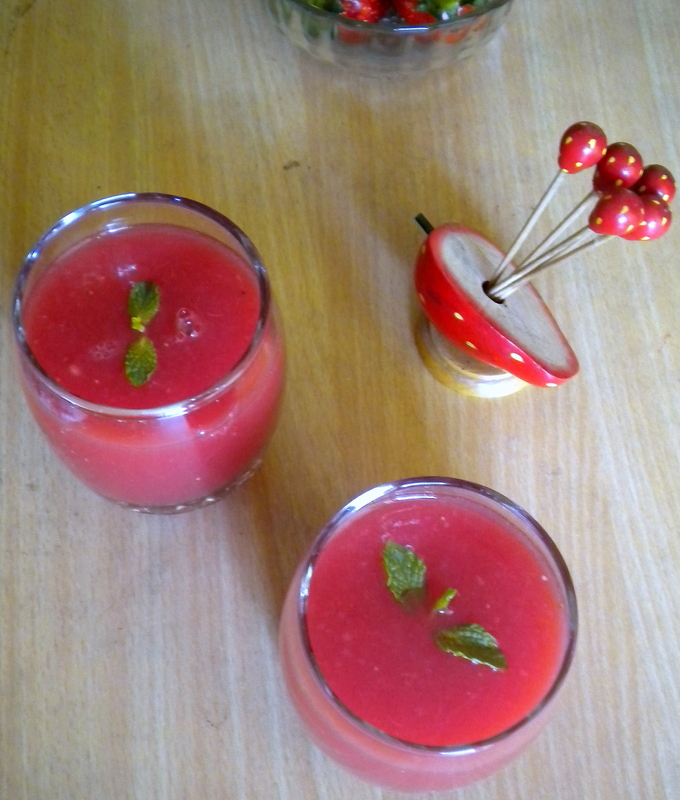 in hot summer cold melon juice vtha ginger touch..loved it..
very refreshing drink...haven't tried watermelon-strawberry combo...loved it color...good one Kaveri!! perfect & so comforting.. i love the addition of ginger.. i just add pepper powder.. will try it next time! Strawberry Water Melon smoothie looks very nice and refreshing. Addition of ginger sure enhance the flavor. Lovely pics.. Really a healthy and refreshing drink for the summers.. Loved the ginger touch in this smoothie Kaveri, lovely clicks. Wonderful combo, I am sure going to try this combo! Awesome drink Kaveri.perfect for the season. Wow love this combo, very beautiful picture. Lovely drink I am so in love with this beautiful color.I am sure it tasted as good as it looks. Hi. Perfect coolant to beat the heat with such a vibrant colour. This is a lovely fruit drink and the gorgeous photographs make it even more desirable. What a lovely colour. 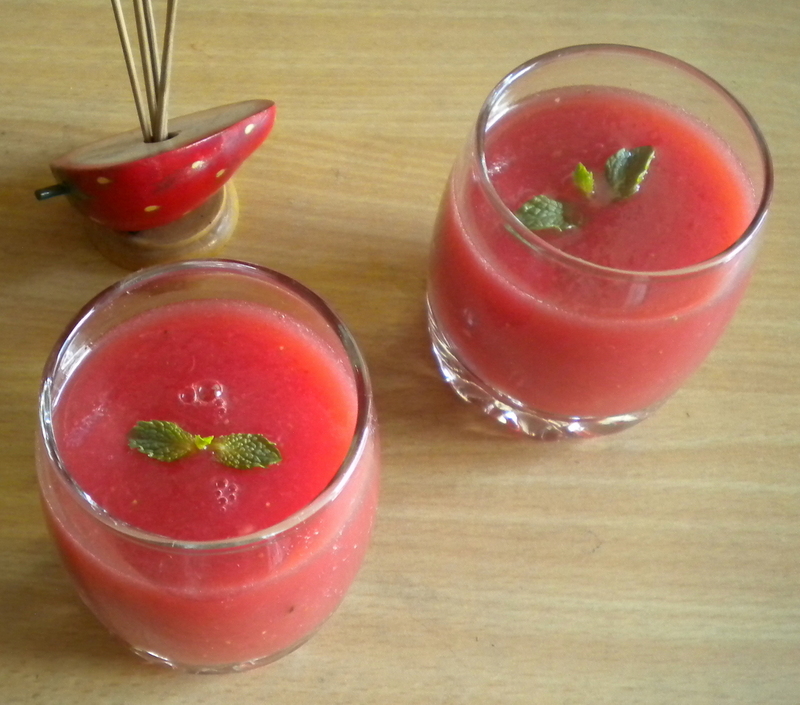 Just today I was thinking of making this juice and brought a watermelon. Will add ginger in it. Thanks. Yummy refreshing cooler.. Thanks for visiting my site.. I am happy to follow you..